We offer a wide selection of metal carports and steel garages in many different widths, heights, lengths and styles. Our portable buildings serve a variety of uses for the home, farm and business. With over 25 years in business, the friendly staff at G.P.B. can design a portable structure to fit your needs and budget. Where required, we can provide engineered drawings with wind and snow load certification for our metal carports and steel garages. The great thing is that instant pricing is available for our full line of carports, garages, and guardhouses allowing you to shop from the comfort of your own home with confidence. For those that prefer diy or to do it yourself we can offer our steel structures similar to a kit. Enjoy your tour of our site and do not forget to bookmark this page as we assure you that you will want to come back! C We specialize in quality metal carports and RV Covers with wind and snow load certification where required. You can be provided with engineered carport plans from a certified engineer providing you with the wind and snow load rating for your car port. It should be noted that car port structural ratings differ from state to state. We have the expertise to fit the carport to your specific local requirements. Our carports are proudly installed in 27 states: AL, AR, AZ, CA, DC, FL, GA, IL, IN, KS, KY, LA, MD, MS, MO, NV, NJ, NY, NC, OH, OK, PA, SC, TN, TX, VA & WV. Our most frequently asked question is, "Does the price online for the carport include shipping, installation & anchoring?" Our answer is, "Yes". Many people are surprised by our extensive service area and flexibility with manufactured portable carports. Our carports come in a wide range of colors, widths, lengths and heights. 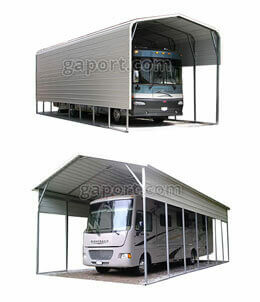 We are sure to have car ports and RV Covers to fit your possessions. M Providing affordable durable steel buildings for countless applications for the majority of the nation. 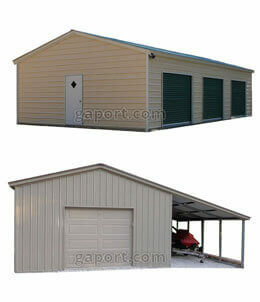 Sturdy all-steel garages are available in 12 or 14 gauge galvanized steel framing. Wall heights are available up to 14 foot high. Depending on the area our garages can be engineered to 60 psf snow load, 180 mph wind load rating and seismic ratings. These are quality metal garages designed for a life time of maintenance-free use. Steel max-rib panels are placed on the roof and sides for a very durable building in the harshest of environments. If you need a large complex steel building or a simple backyard workshop, we are here to help. Our knowledgeable, honest sales force can assist you in selecting the right steel building for your needs. Many persons are delighted to find our installed prices are less expensive than the kits sold online. Instant and reliable metal garage pricing is just a few clicks away. If you need help, please call us. We truly do have a complete line of affordable carports, garages, sheds and guardhouses to fit any budget. "You guys must be the most efficient company I have ever worked with!" "They did an outstanding job. With this service you will get plenty of business." "Your guys did great work, and I'm happy as a clam with the building. Thanks again." "I am very impressed with the quality workmanship and would gladly recommend GPB to anyone I know." "It is rare to find anyone in this world that seems to care anymore. Your showing a sincere interest is exactly why we came back to you guys." "You can say that we are very satisfied customers and will recommend GPB to everyone." "This structure is solid as a rock and I am very happy!" "It's the best value I have purchased for my land; it is solid and I am very, very pleased." "Again, thanks for all the help. It has truly been a pleasure doing business with you." "Just wanted to write and say how happy I am with dealing with your company." "G.P.B., Inc. is a class act. I will definitely recommend them to anyone I know." "I was very pleased with the whole experience from the initial sales call to the construction."